Now that the weather has cooled off. Sorry, I couldn’t help myself. I’m in Florida, remember? It might have slipped down into the 70’s today, but that’s because there is a hurricane out in the Gulf of Mexico. This IS cool for us! Ahem, as I was saying…now that the weather has cooled off, it’s time for some stick-to-your-ribs soups and stews. One of my most favorite kitchen gadgets to use when making heartier meals is my pressure cooker. Back in your grandmother’s or even your mother’s time, a pressure cooker was the modern kitchen convenience gadget du jour. It was the original microwave oven. It cooked fast, used little energy, and didn’t require a lot of cooking know-how to turn out a good meal. Unfortunately, pressure cookers have a bad rap for being unpredictable and dangerous. My husband often remarks about when his mother used to yell at him and his siblings to stay out of the kitchen when her pressure cooker was hissing away on the stovetop. She didn’t want anyone to get hurt in case the thing exploded, incapacitating a helpless bystander with molten beef stew. Yes, pressure cookers did explode back in the day, but thanks to many years of ingenuity and manufacturing, today’s pressure cookers couldn’t be safer. Most pressure cookers have 2, 3, even up to 4 overpressure valves, o-rings, and seals that prevent even the most careless accidents from happening. So, with that, let’s makes some soup! I use a 6 + quart Fagor Rapida pressure cooker, which is perfect for today’s dish, Lima Bean Soup. I have mentioned this soup in the past, and it’s one of my favorites. All right, let’s have some introductions. Most pressure cookers have two pieces, a lid and a pot. My Fagor lid has an operating valve (the black knob), a pressure safety lock (the green switch), and a pressure indicator (the yellow pop-up button). So, let's get our ingredients and get cooking! First, I sauté the ham till it releases a little fat, and then throw in the onions, celery, and garlic. Saute till vegetables are soft, add the beans, water, chicken broth, seasonings and most importantly, the olive oil. Dried beans have a tendency to foam when they are cooking and the oil helps prevent that. Foaming beans are BAD and could potentially clog one of those overpressure safety valves, which at the most would make a huge amount of noise when the thing blew. No one would get hurt, but it would scare the living daylights out of you. Once all the ingredients are in the pot, I line up the lid and close it. My Fagor has indicator lines that guide me to seal the cooker. If a seal is not made, I would know by the amount of steam escaping from below the lid. Switch the operating valve to "close". After sealing, I lock the lid by switching the pressure safety lock from “unlock” to “lock”. Notice how the little yellow indicator button is depressed? Turn the stovetop burner to med-high and wait for the contents of the pressure cooker to heat up. When the cooker is sufficiently heated and pressurized, the indicator button will pop up like this. At this point, lower the heat to low and start timing. For my Lima Bean Soup, I looked for guidance in Lorna Sass’ book titled “Pressure Perfect” and set the cooking time for 30 minutes. If you are serious about trying this pressure cooker thing, get this book! It’s basically the pressure cooking bible. Once the soup has cooked for 30 minutes on low heat, move the pressure cooker to a cool burner and let it depressurize naturally. Don’t try to rush it, don’t switch the operating valve to “open” and do what’s often called a “quick release”. Some recipes do require a “quick release” to allow for steam to escape, which makes the cooker depressurize much faster, but that’s for another recipe and time. When sufficiently cooled, the indicator valve will pop back down again. Unlock the lid and open it AWAY from you as there will still be a lot of steam inside the cooker. You don’t want an instant Lima Bean Soup facial! Now, it’s soup! Taste the soup and season accordingly (salt, pepper, etc.). If, for whatever reason, the beans aren’t cooked through, bring the pressure cooker back up to pressure and cook an additional 5 minutes and depressurize naturally. See, wasn’t that easy? 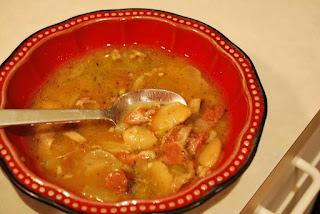 If I were to cook this dish “traditionally” in a pot on the stovetop, it would have taken a good hour or two (or more) in order for the beans to cook to the desired tenderness. You knew I had a phobia of pressure cookers, didn't you? The day my friends' pressure cooker decorated her kitchen ceiling with black beans, was the day my phobia began. And no amount of therapy will cure it. So, I'll gladly make your deliciously robust soup, but only the old and slow way. I'm not working this week, so I'm in no hurry. LOL, awwww c'mon Sol! How long ago was this? It's safe, I promise! Still, I've heard some scary stories, but fortunately today's PCs are pretty much fool proof. Once you use one, you'll say, "How did I ever manage without one?" That's what DM tells me, "if you use one, you'll wonder how you ever managed without one." This may be true. But she also had a big KABOOM in her own kitchen once. Thankfully, I was not present to witness the explosion. But the fear still lingers. Just the same (and to prove I'm not all wimp, I'm going to check out the newer models. I may just surprise myself, and bring home one of those kitchen detonators. This soup sounds amazing I used to eat soups everyday because I live in a cool place to me it's the best but I have some friend that said that eat soup at lunch is disgusting. I just made the soup using your recipe, very nice. I used 1/2 tsp. celery seed instead of celery and a smoked ham shank. Just like gramma used to make. I noticed you did not mention soaking the beans. Was that an oversight? Nope, that's the beauty of using a pressure cooker! The cooking time is dramatically reduced due to the pressurized cooking. No soaking needed. Marysol, get a electric one they have safety features so they won't blow up. 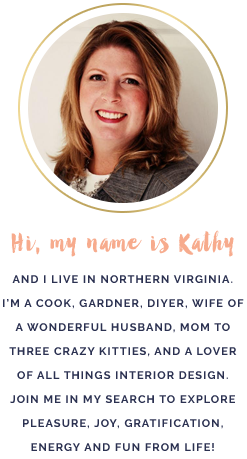 I was terrified of them and I LOVE my instant pot! Using it today to make dinner!